Notifications can disturb you at times when you have an important meeting, business or a work. Especially group chat features of the messenger applications can give you lots of troubles. There are lots of messages on groups and a lot of file sharing. That means tons of notifications on your phone. Disable notifications on a messenger is quite easy. If you are using WhatsApp messenger, we are going to give you some information about that on this page. You can ask us anything about this subject. What Happens When You Disable Notifications? Firstly you will need to go to settings of your phone. Swipe down on your phone until you see the WhatsApp. Tap on WhatsApp Messenger app. We recommend you to disable “Background App Refresh” from this section. If you don’t care much for notifications, background refresh won’t be something that you will need. After you are done with “Background App Refresh”, tap on Notifications. The first option is “Allow Notifications” at. It is at the top of the options. Please disable it. That is all! If you disable notifications, you will not know what is going on on the application. If you missed a call, you will not see any notifying message for this. You will not know when your friends send message to you and it applies for calls too. We don’t recommend disable notifications generally. However you can always do it for a short time. 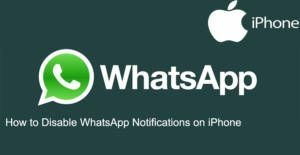 You can get back WhatsApp notifications with similar steps which we provided for you above. If you have any other question about this, please don’t hesitate to ask us.